"I am attached to this country like every other Haitian, Reginald Boulos said, despite the discouragements. I find myself loving this country and I cannot explain why. "I was born in Manhattan because my mother had a complicated pregnancy," Reginald Boulos said. "I came back to Haiti 14 days after I was born, I've only spent one year outside of Haiti since I've been born." "I am Haitian because my father and grand father are Haitian, because my mother and both her parents are Haitian." "I am 4th generation Haitian," Reginald Boulos said. "My Great grand father came from Lebanon back in the year 1875. It's been at least 140 years since the Boulos family has been living in Haiti." "I went to school (primary and secondary) at Petit Seminaire Collège St Martial... I went to the University in Haiti to become a doctor at the Faculté de Médecine," Reginald Boulos said. "I am the same promotion as Dr. Reynold Savain and Dr Georges Michel." "The only time I spent one year away from Haiti was to go get my Masters degree (maitrise) in public health. That's my area of expertise. I am a public health doctor and I worked in that field for 14 years in Cite Soleil." Reginald Boulos: I am Haitian... The Lebanese are considered a white race, so you could consider me white on the exterior and black on the inside. Journalist: Do you think your color plays in your favor. Journalist: Rephrasing the question Do you think it is because you are Syrian-Lebanese and the color of your skin white that you have amassed this fortune, Dr Boulos? Reginald Boulos: In a sense, yes. because the the mulato bourgeoisie, I am making a difference and I will explain why, imposed certain advantages from the imperialist super powers back in the years 1860s through the 1890s. If I am more privilege than others, it is not because my skin color, it because of hard work of my grand father. Remember, when I was a kid they used to call me "arab bwèt nan do." My family came here with no money, they used to live downtown above their place of business. We work hard and this is a well known fact about the middle-eastern people. They are very hard working and very good businessmen and women. Journalist: Are you very rich? Reginald Boulos: There are no rich people in Haiti... I am not poor but there are no rich people in Haiti. Everything is relative in life and everything is a question of the ladder. In the United States I would be considered middle class... I would not be able to start any type of business in the United States, I don't have that kind of money. 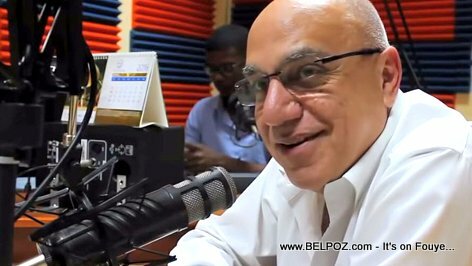 There are no billionaires in Haiti, Reginald Boulos said. False, there is no such thing a one percent of the population that controls the economy because the Haitian economy is informal for the most part. When I was little, if you wanted to purchase building materials, the one name that came to mind was Raymond Flambert. Today, if you want to buy building materials, you just go to the nearest 'quincaillerie' (hardware store) closest to your house which belongs to a small business man. If you want to ask me if I am part of the one percent who pays 80 percent of the taxes in this country, then the answer is yes. That's the part they never talk about. They just say the top one percent.